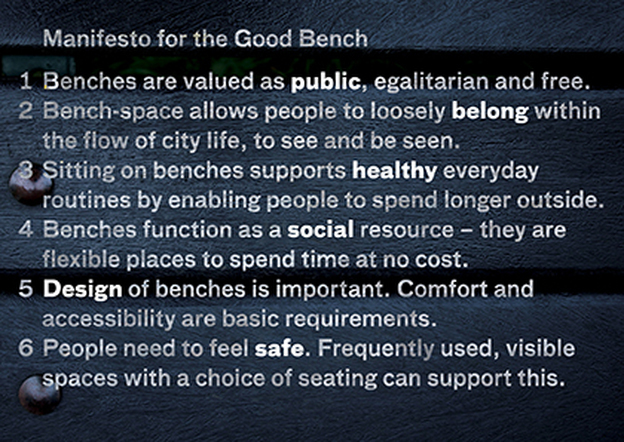 ​Benches are valued as public, egalitarian and free. Bench-space allows people to loosely belong within the flow of city life, to see and be seen. Solitude and conversation are equally acceptable. Sitting on benches supports healthy everyday routines by enabling people to spend longer outside. These opportunities to rest can be restorative for mental health and support local walking when personal mobility is limited. Benches function as a social resource - they are flexible places to spend time at no cost. This is appreciated by many, and especially vital for people who are largely marginalised from other collective environments such as work, cafes, educational or leisure facilities. They are contrasted positively with crowded, lonely or boring home situations. Design of benches and of sittable public space is important. Comfort and accessibility are basic requirements. Clustering of benches and co-location with a range of facilities provides interest and gives legitimacy to hanging out. The ability to gather in larger groups is valued by many. People need to feel safe. Frequently used, visible spaces with a choice of where to sit can support this. A mix of short and long stay bench users supports informal safety in numbers. Quality of materials, attractive planting, and cleanliness of public space seems to increase individual tolerance for the proximity of strangers and diverse ways of enjoying public space. Benches should be recognised and promoted as a social good, core to supporting mental health and active lifestyles policies. Local strategies should address inequality in quantity and quality of benches in urban locations, and these should reflect the access and wellbeing requirements of different users of benches. Formal and incidental public space should be maximised as a local social resource by clustering of benches and co-location with leisure facilities and local services. Design of public spaces should increase the quantity and diversity of non-commercial seating, and introduce natural elements and planting wherever possible. The traditional two-seater bench may have had its day: longer benches and larger seating structures are more adaptable in supporting fluid social networks. Benches need to be comfortable as well as robust. ‘Hostile architecture’ approaches have led to a reduction of bench provision and the specification of deliberately uncomfortable seating in some places. Thermal comfort, height, backs and arms of benches need to be human friendly. Research and innovation in product design and landscape architecture are needed. Management of public spaces should ensure hanging out is legitimised as a non-criminal activity: balancing safety agendas with a meaningful inclusivity of diverse people and activities. In busy urban places the role of uniformed wardens is largely welcomed in maintaining acceptable communal behaviour as long as this is exercised with a light touch. Minimise potential conflict to reduce reliance on explicit security measures. ‘Anti-social behaviour’ is often simply differently-social. While violent or hate crime should be actively addressed, this should not be at the expense of bench provision or the quality of the public space. People should be encouraged to use benches through integrated planning, design and management. Key aims should be to support high pedestrian movement through open space networks, maintain good visibility, zone quieter and noisier areas and give options of where to sit.